While there are millions of smartphone apps available, and many of us have downloaded a vast selection on our own devices, recent research has revealed that we spend the majority of our time on just five apps. According to a report by Forrester Research, US and UK smartphone owners “use an average of 24 apps per month but spend more than 80 percent of their [in app] time on just five apps”. 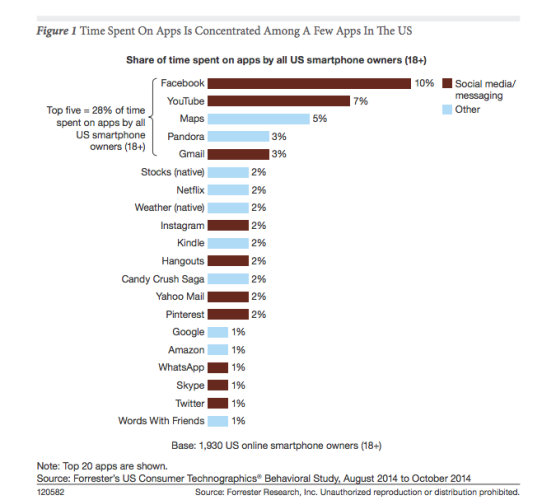 Facebook leads the charge when it comes to the share of time spent on apps by US smartphone owners over 18 years at 10 per cent, followed by YouTube (7 per cent) and Maps (5 per cent). In a recent post on VentureBeat which cites these statistics, author John Brandon also notes a recent article posted by Sar Haribhakti on Chatbots Magazine which explains why people are straying from apps and starting to use chat bots (computer software designed to simulate intelligent conversation through written or spoken text – a type of artificial intelligence). He also highlights the danger that people could only end up using a handful of chat bots as well. “Basically, app developers can make apps all day, but an average Joe uses only a bunch of them on a consistent basis,” he said. “This is probably so because a small collection of apps fit into the lifestyles of millions and serve all (or most important) their needs and desires. A good chunk of these apps are social in nature. No surprise there. So, now, if bots are the new apps, what’s going to make mainstream audiences (again, you probably don’t count) to use them? What’s going to make them install or search for and consistently use even five bots?